Maintaining control on the high seas is virtually impossible. You’ve got weird monsters climbing up from the depths, curses that you have to constantly cleanse, and treasure that never seems to be hiding exactly where it has promised to stay buried… not to mention loads of other competing pirates that are certain that they deserve to captain your ship more than you! There’s only so many things that a pirate captain can do to keep that edge… and swinging your cutlass and making mutineers walk the plank is only a solution for a short period of time. Eventually, they stop listening… or you run out of crew! Fortunately, the major symbol of pirate leadership hasn’t changed much over the years: the hat. A keen pirate hat commands attention and demands loyalty and you will be certain to have both with this Black Caribbean Pirate Hat. 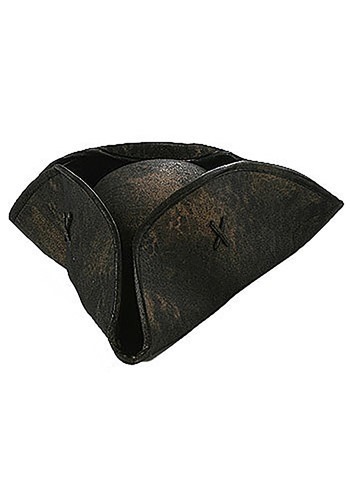 The black faux leather tricorn design makes for the most recognizable seafaring look and has a built in elastic band to ensure it fits well and is less likely to be blown away by any unexpected hurricane winds. Put your best foot (or peg-leg forward) and give the command to set sail to the next treasure horde because, with this hat, you have no fear of mutiny… probably.